What's not to like? A good looking colourful book full of photos of your favourite guitarists' tools of the trade. Lisa S. Johnson has created such a book but has added the master touch of making the photos interesting from an unconventional and artistic point of view. So the photo of, for example, Ted Nugent's famous Gibson Byrdland guitar is a close-up of its edge showing his initials etched into it. Furthermore, the back of the Springsteen's famous Telecaster is shown instead of the front, with the years of use shown by the worn out varnish making it a great photo. That's the beauty; there are plenty of photos of guitars in all their glory but never from the same angle or with the same amount of light. Why one hundred and eight guitars instead of one hundred? Well, the book explains in the introduction that one hundred and eight is a mystical number from an astrological point of view (e.g. the sun's diameter is one hundred and eight times that of the earth, the digits of one hundred and eight adds up to nine which timed by the number of star signs brings you back to one hundred and eight and so on). This provides the worthy excuse for a spiritual cover design. 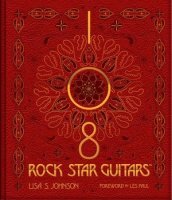 In fact the book treats guitars like divine items and, of note, has a foreword by the late Les Paul. The book took fifteen years to make and Paul for one was very impressed. With that commendation, my positive review is all but superfluous. I will add that nearly all the guitarists you can think of are included (Richie Blackmore is not there but I was glad to see Michael Schenker having three pages dedicated to his flying Vs). As for my favourite guitar in the book, it has to be Dave Mustaine's Dean guitar with the 'Rust In Peace' artwork.